The film’s tagline reads "No Plan. No Backup. No Choice." Which is what’s happening this time round for Ethan Hunt and his crew from IMF in Mission: Impossible - Ghost Protocol. This action spy film directed by Brad Bird. It is the fourth installment in the Mission: Impossible series. Ghost Protocol is set when the IMF is shut down when it's implicated in the bombing of the Kremlin, causing Ethan Hunt and his new team to go rogue to clear their organization's name. The film stars Tom Cruise reprising his role as iconic agent Ethan Hunt with a cracking team that includes: Jeremy Renner as William Brandt, IMF Secretary's chief analyst and former IMF field agent, Simon Pegg as Benji Dunn, an IMF technical field agent, Paula Patton as Jane Carter, and Michael Nyqvist as Kurt Hendricks, a Swedish-born Russian nuclear strategist and the film's primary antagonist, Léa Seydoux as Sabine Moreau, a French assassin for hire and Tom Wilkinson as an IMF Secretary. The cast gave thrilling performances thank to the solid script and genius direction of Brad Bird (The Iron Giant (1999) The Incredibles (2004) and Ratatouille (2007)). Cruise gave another thrilling performance as Hunt despite my minor reservation about his age and ability to top the last film. If there are any more future installments, let’s see how well he holds up. Renner gave an intense performance. Pegg gave a humorous performance. Like his role in Star Trek (2009), Pegg provided comical relief, despite the other characters having a little more humor than the last films, even in the most intense scenes. Patton gave a physically intense performance, she was able to bring so much in that particular department alone. Nyqvist gave a brilliant performance despite his role being much smaller than I imagined. This also goes to Seydoux and Wilkinson. Despite giving fantastic performances, they were unfortunately given very minor roles and were ultimately cut too short. 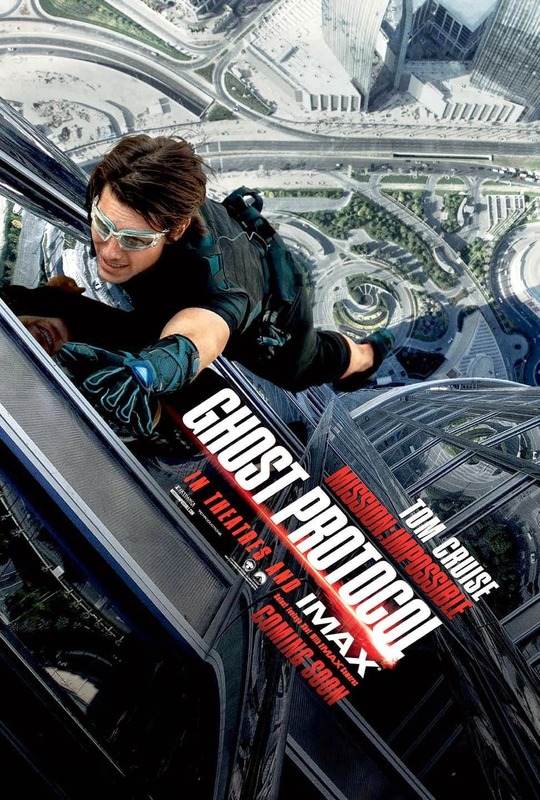 Mission: Impossible - Ghost Protocol is a gratifyingly clever, booby-trapped thriller that has enough fun and imagination and dash to more than justify its existence. The film still presents the same business as usual, but it's the best kind of business as usual, and it finds everyone working in top form. Sure it's all poppycock, but it's done with such vim and vigor and both narrative and visual flair that you care not a jot, thanks to Bird’s genius direction. It has an inspired middle-hour pumped by some solid action. We now live in a post-Bourne, recalibrated-Bond universe, where Ethan Hunt looks as though he is on track to getting where these franchises are at. To conclude, if you want to see intelligent action and computer-generated sequences executed with breakneck speed and technical precision, then go see this film. I am getting to the point where I don't much care about whether or not this film will deliver, because it does. The plot in this film hangs together better than the other three films in the series. Film Review: "Puss in Boots" (2011). "My thirst for adventure will never be quenched!" And that's the heart of Puss in Boots. 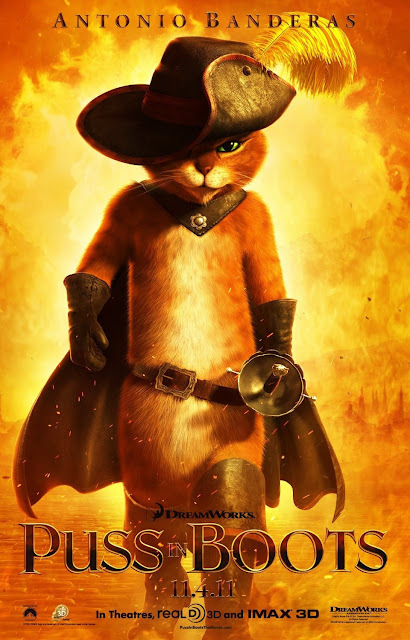 This computer-animated fantasy action comedy film directed by Chris Miller, written by Tom Wheeler and produced by DreamWorks Animation.Years before meeting Shrek and Donkey, the adorable but tricky Puss in Boots must clear his name from all charges making him a wanted fugitive. While trying to steal magic beans from the infamous criminals Jack and Jill, the hero crosses paths with his female match, Kitty Softpaws, who leads Puss to his old friend, but now enemy, Humpty Dumpty. Memories of friendship and betrayal enlarges Puss' doubt, but he eventually agrees to help the egg get the magic beans. Together, the three plan to steal the beans, get to the Giant's castle, nab the golden goose, and clear Puss' name. Although the character of Puss in Boots originated in a European fairy tale in 1697, the film is a spin-off prequel to the Shrek franchise. It follows the character Puss in Boots on his adventures before his first appearance in Shrek 2 (2004). The film had been in development since 2004, when Shrek 2 was released. As a Shrek 2 spin-off, it was initially planned for release in 2008 as a direct-to-video film, then titled Puss in Boots: The Story of an Ogre Killer. By October 2006, the film was re-slated as a theatrical release due to market conditions, and due to DreamWorks Animation's realization that the Puss character deserved more. In September 2010, Guillermo del Toro signed on as executive producer. A conscious decision was made to make the world of Puss in Boots very different from that depicted in the Shrek films. In the latter, the backgrounds and stylizations are very fairy tale. Here, it has a distinctly Spanish feel with warmer, more orange colors. It stars Antonio Banderas, Salma Hayek, Zach Galifianakis, Billy Bob Thornton and Amy Seders. The cast gave entertaining performances, with each giving their own unique personalities. Banderas giving his suave Spanish charm. Hayek giving her seductive charm and Galifianakis giving his outrageous comedic flare. Despite this, it does not live up to the original personalities in the Shrek films. Puss in Boots is fast and brightly colored enough to entertain small children, but too frantically silly to offer real filmgoing fun for the whole family. While there are plenty of madcap antics to fill a feature, all that manic energy ultimately proves to be somewhat exhilarating. Granted, it's no classic, but a sassy script and good-natured voice work from Antonio Banderas, Salma Hayek and Zack Galifianakis should keep kids entertained. Frenetic and frequently funny, the movie represents the DreamWorks Animation franchise style – which boils down to self-aware, but naïve, talking animals who learn kid-friendly life lessons – at its most palatable. The lack of originality is offset by sheer silliness, including Classified and Skipper's Abbott and Costello-style argument over whether there's a long I in 'diversion.' The word fits the movie. 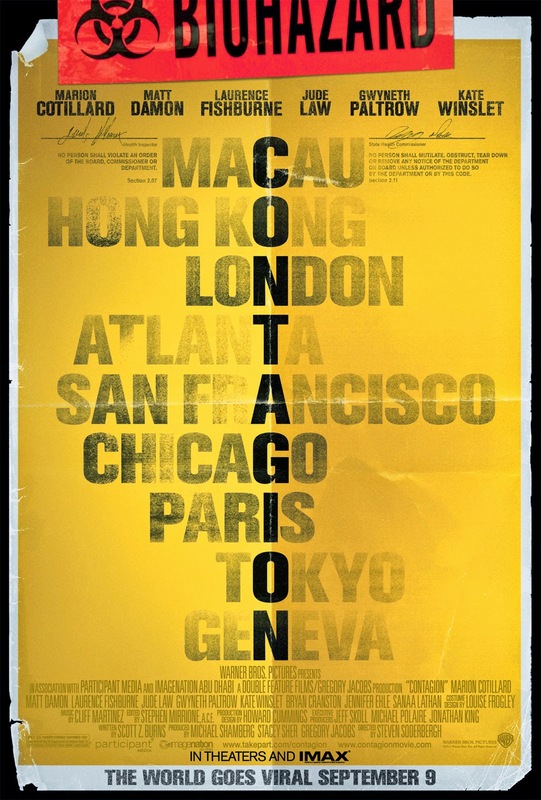 The film’s taglines such as "The world goes viral September 9" and "Nothing spreads like fear" sums perfectly what Contagion brings to a theatre near you. This Medical Disaster Thriller directed by Steven Soderbergh. Contagion follows the rapid progress of a lethal indirect contact transmission virus (Fomite Transmission) that kills within days. As the fast-moving pandemic grows, the worldwide medical community races to find a cure and control the panic that spreads faster than does the virus itself. As the virus spreads around the world, ordinary people struggle to survive in a society coming apart. T. S. Elliot once wrote, "This is the way the world ends: not with a bang but a whimper," Soderbergh was motivated to make an "ultra-realistic" film about the public health and scientific response to a pandemic. The movie touches on a variety of themes, including the factors which drive mass panic and loss of social order, the scientific process for characterizing and containing a novel pathogen, balancing personal motives against professional responsibilities and rules in the face of an existential threat, the limitations and consequences of public health responses, and the pervasiveness of interpersonal connections which can serve as vectors to spread disease. Soderbergh acknowledged the salience of these post-apocalyptic themes is heightened by reactions to the September 11 attacks and Hurricane Katrina. As filmmakers J. J. Abrams and Matt Reeves acknowledged the September 11 attacks in their disaster film Cloverfield (2008), where the film's central monstrous antagonist personified the September 11 attacks itself. The movie was intended to realistically convey the "intense" and "unnerving" social and scientific reactions to a pandemic. Like an Irwin Allen disaster flick (The Poseidon Adventure (1972) and The Towering Inferno (1974)), the film featured an A-list ensemble cast that included Marion Cotillard, Matt Damon, Laurence Fishburne, Jude Law, Gwyneth Paltrow, Kate Winslet, and Bryan Cranston. Despite the cast giving strong performances, it was an engaging or even relatable. My good friend and colleague, Kelly Ryu, once told me that the film would have been more realistic if Soderbergh cast unknowns rather than well recognizable actors for the roles. Then the whole film would been more realistic, more terrifying, more well received and the film would have catapulted the unknowns to stardom. A film that did this so well was, once again, the monster-disaster epic Cloverfield, which all starred unknowns. Contagion is splendid entertainment that will get you worried about whether they'll be able to contain that strange virus. The movie's craft makes the dread of a killer virus contagious: viewers may feel they have come down with a case of secondhand SARS or sympathetic monkeypox. Heedlessly derivative though it may be, the film what it sets out to do and then some -- scare us out of our wits, then get us to apply those wits to an uncommonly intelligent and provocative disaster flick. What also makes it effective, and sets it apart from other thrillers, is that it makes you care about the characters.